I love dogs. I treat them all like if they were mine. They are so adorable. 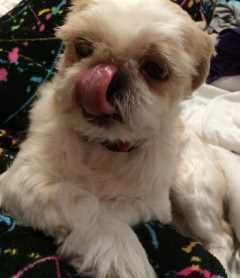 I have a pet shihtzu (dog) he is 8 years old and I found him abandoned. I've had him for years now. I know how to give oral medication. All dogs love me. I offer taking care of your dog over night. I also offer only during the day. And I also offer so bath your dogs. I don't allow any other pets that aren't dogs. I walk with them to an open outdoor place in my neighborhood and they can run and have fun. I have great accommodations for them. Imandra's service is located in or nearby Miami, Florida. Book via PetBacker for Insurance, Payment protection & 24x7 support. If you have hired Imandra before, leave a review now. Contact Imandra now with your pets info. If Imandra is busy, we can help include similar Backers.